New from StorDigital the DP50 DVD/CD Printer offers out-of-the-box automated printing for in-house CD and DVD production. With its capable 50 disc capacity the StorDigital DP50 DVD/CD Printer offers out-of-the-box printing of 100's of discs per day. The first automated printer from StorDigital will prove to be the new benchmark for in-house disc printing solutions. Using the industry standard HP print engine and a patent-pending disc loading system, the DP50 offers support for artwork created on a range of applications meaning that the DP50 is the most flexible solution on the market. The DP50 offers fast full colour hi-resolution printing, allowing customers to produce discs costing from just a few pence to print. 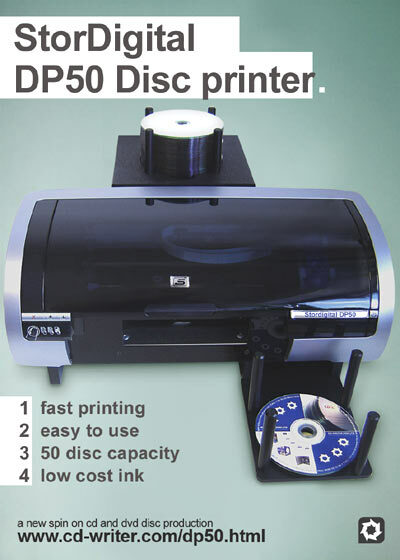 Using its own intuitive disc labeling software the StorDigital DP50 CD and DVD printer can even produce glossy, water resistant prints, when used with WaterShield discs from Taiyo Yuden or Dri-Gloss discs from CD-writer.com. Nic Ranshaw (MD of CD-writer.com and CEO of StorDigital Systems) had this to say; "Over the last 7 years we have helped many 1000's of our customers enter and develop their businesses within the CD and DVD production marketplace. We feel that the DP50 fills a gap in the market for a well designed and robust automated solution, that is cheap to run and easy to maintain." He added, "The StorDigital DP50’s simple design, robust build and low ink costs will all be very attractive to customers. This is the perfect time to upgrade or invest in a new disc printing solution". The StorDigital DP50 DVD/CD Printer will be available to trade customers and end users from CD-writer.com Ltd and their partners. To register for a CD-writer.com trade account log on to http://reseller.cd-writer.com. Those clever people here at CD-writer.com have introduced a brand new service aimed at supporting customers of our DVD and CD duplication hardware. CopyCredits are part of a new enhanced service level agreement designed to enable customer with external production capacity, to cover periods of increased demand or or system down time. CD-writer.com Ltd will bundle CopyCredits into hardware solutions giving customers peace of mind when it comes to quoting on CD and DVD production jobs. CopyCredits can be ordered at the time of purchase of hardware from CD-writer.com, and will provide the customer with discounted DVD and CD production time that is paid for in advance. Initially CopyCredits are available in units of 100 CD or DVD, printed and suppleid with printed paper parts, assembled into cases. A maximum of 1200 units can be purchased and used ofver the course of 12 months. Managing Director Nic Ranshaw said, " This is the logical extension of our product and service operations. To extend and combine our production services mean we can bring a whole new offering to our customers. This is a totally original solution and I have never seen anything like it in the market before. " "Our DVD CD production service is second to none and I think our hardware customers will find this level of support incredibly valuable " he added. CopyCredits are avaiable to buy alongside DVD CD Duplicator and Printer solutions from CD-writer.com now.